Troutist and Daiwa are a great pair! Went fishing today on the Salt River in Arizona and had an amazing day! Just received my Troutist Darkness 4lb test line and my Daiwa Crusader gold and red spoon 2.5g and I could not be more satisfied with these two items. 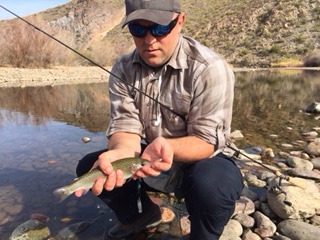 I don't have the cash to invest in one of the nice set ups on Chris's site so I just use a UL Bass Pro Carbon Rod 6'4" with a Pflueger President 20x reel. I'll start with the Troutist Darkness line, by far the best line I have ever used. I normally fish Seaguar but I thought I would give this a try and I will never be using anything else. It is by far the smoothest casting and thinnest line for the lb test I have ever used. Now the spoon, I normally fish with in-line spinners but like most, I'm sure I get frustrated with all the line twist so I thought I would try a spoon since I haven't used one since I was a kid and throwing the old daredevils. If I'm lying I'm dying - on my first cast BOOM hook up and it was game on for the rest of the two hours I was fishing. Managed to catch 15 trout only losing one off of the single micro barb hook, which I must add are the only way to go for me now when trout fishing. Air temp was 70 degrees with loads of sunshine and got to see a family of bald eagles and an osprey smash a trout in the river, needless to say, it was a damn good day! Comments for Troutist and Daiwa are a great pair! Haven't tried the Troutist yet but I've been meaning to. I fish a lot of home made French spinners so do get the twist occasionally. Been fishing the Crusaders tho and they work great. Went out again today with my daughter ended up with 10 total 6 on the crusader spoon! However, after that, we lost it to a nice sized rainbow. So needless to say I will be buying more of those spoons from Chris shortly. One thing I have learned but I guess haven't written about is that it is important to check your line from time to time. The spoons will go over rocks pretty well without getting snagged, but the rocks do abrade the line. It doesn't take too much abrasion to weaken it. You don't want to lose spoons or big fish! Yes Chris that is a great point, and I’ve fished for years but I like most I sure have those days where the fishing is so good you don’t want to stop to check your line. But it certainly is a great practice to get into when you're fishing streams! So THAT could explain the 3 line breaks I experienced yesterday! I'm relatively new to fishing, but having a ball with both my Tenkara and Tenryu spin rods. I was having a record day (for me) yesterday, but had a few line breaks on Sunline 4lb Troutest line. In 6 hours of fishing, I never checked the line for abrasions. That could be the culprit.